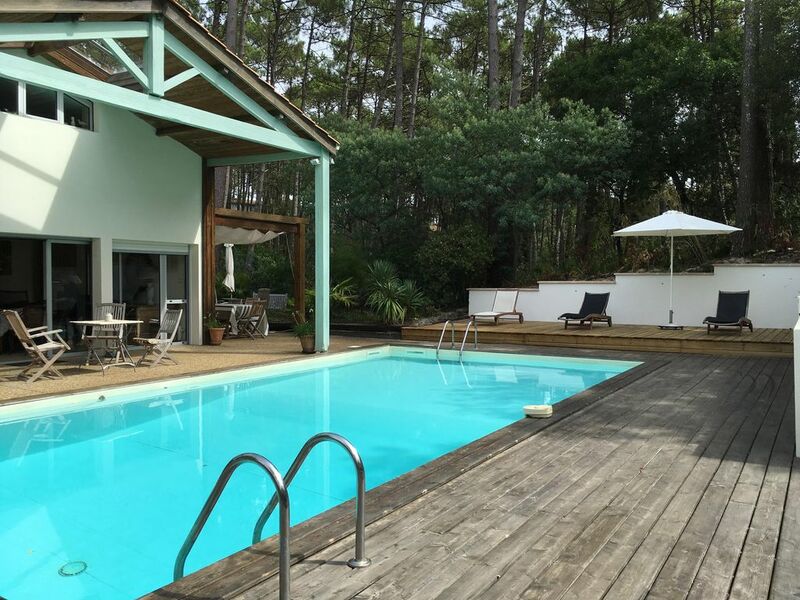 This high standard villa with a private pool of 10 x 5 m in Lacanau Ocean in a green setting in the heart of the Ardilouse Golf Course. This villa has high comfort but also a shaded and covered terrace by the pool with summer dining room. Located between the lake and ocean, this setting offers calm and tranquillity. Inside is a lounge and dining room leading to the garden and pool, an equipped and appointed kitchen, a cellar and utility room, four large double bedrooms, an individual bedroom, two bathrooms, a shower room, three toilets, a large gallery study area with Internet access, lounge, library and relaxation area. This not overlooked villa offers a direct access to the club house and bicycle paths. Linen, accessories for bed and towels corresponding to the number of people can be rented. Please inform us upon booking. solution . Il est évident que si nous en avions été informés, nous n’aurions pas loué cette maison . It is on the international golf course of the Ardilouse of 18 hole and the great golf course of 9 hole of the Mejanne in a green setting between the lake and ocean. You can practice all water sports but also tennis, horse riding, biking and thalassotherapy, a few kilometres away from the Medoc Castles, their great wines, the Bassin d'Arcachon, Cap Ferret Bordeaux World Heritage of Unesco, pubs, restaurantsand casino that are perfect for your parties. La location devient effective à réception des arrhes et du contrat de location signé des deux parties. Des arrhes de 30 pour cent du montant de la location sont demandés pour la réservation de votre séjour ainsi que le montant de la location du linge(20 euros par personne semaine). Payable le jour de votre arrivée le solde du montant de la location, le forfait ménage ainsi que la caution.